It’s finally here: the 802.11ax-AP-Series by Aruba. Yesterday, during their Presentation at Mobility Field Day, Aruba announced the next Series of Access-Points. There have been numerous rumors about the name, feature-set and Release-Date, but now we can take a first look into this new Land of 802.11ax. The standard itself is under construction for quite some time now and its timeline was delayed by different reasons. Still under development, we are at Draft 3.0 right now and it’s taking shape – not only on the theoretical side. Chip-Vendors announced and shipped the first demo-chip-sets in the Fall of 2017, yet there are Vendors, who already announced their first 802.11ax APs to the market. Yesterday Aruba joined this circle with its new AP5xx-Series. As always, Aruba focused in their presentation on the important, technical stuff. Beside explaining the advantages of 11ax they talked about the core-features of the upcoming APs. In total there are yet three announced, but more APs are planned. Another thing to look at when comparing 11ax-APs is the 2.4GHz-radio, as this band is also getting some attention by the standard – after 10 years of 11n. With features like OFDMA and UL/DL-MU-MIMO you can gain enhancements in spectral efficiency, which is needed way more in the 2.4GHz band, than on 5GHz. With a 2×2 design at the AP-515 and a 4×4 design in the other both APs, Aruba has started it’s movement in the world of 11ax with a radio, which is neither to small, nor to large. We can only guess how 11ax will work with a mixed network after freshly deploying the APs, so it is good that Aruba is not rushing anything. They also promised to update the APs to the final 11ax-standard by software. They didn’t want run in head first and maybe create an AP that is a pre-standard only product, that is why they try to get the AP WiFi-certified in August 2019. Another thing to consider with 11ax is Multi-Gigabit-Ethernet. With 11ac I didn’t see any AP in the „real world“ having problems with a normal gigabit-connection, not even at the large hacker-congress in Germany. With 11ax this might change. Therefor Aruba has build in Multi-Gigabit ports into the new APs with all of them being dual-port. The AP-515 has one 2.5 Gigabit and one 1 Gigabit port, the other ones have two 5 Gigabit ports. As always, they will still work with a normal Gigabit link. Anyway, if you might weather having only one Gigabit to the AP is enough, I can assure you: no need to hurry, buying new switches still has some time. As the number of 11ax clients will be quite low in the beginning the advantages of 11ax won’t make such a difference, meaning that there is some time to buy new switches. 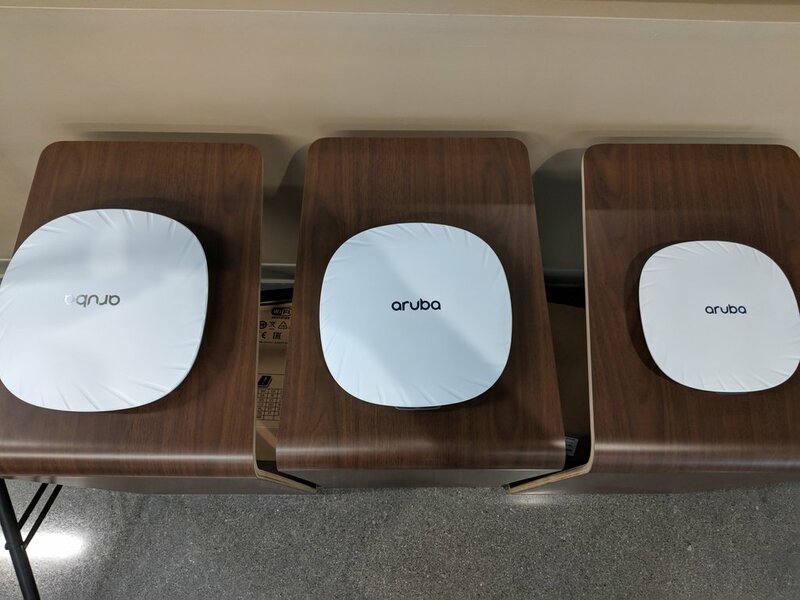 @ArubaNetworks #MFD3 Late 2018 Aruba’s first 11ax products will be available!!!! In general I’m exited for the new APs to being shipped. According to this tweet this even might happen this year. They did a good job developing the APs and they get a big plus for doing it that thoughtful, I wish more vendors would do it that way.